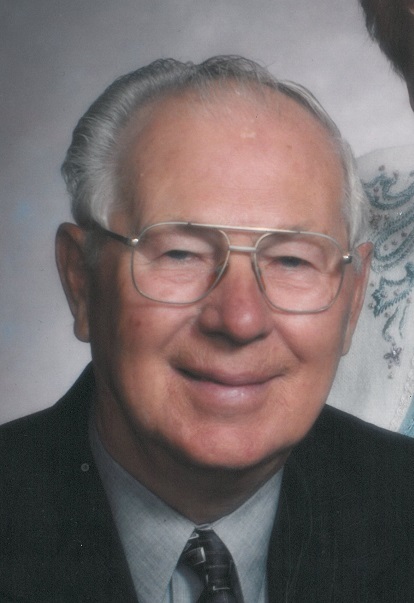 CLINTON – Glen W. Hahn, 89, of Clinton, Wis. died Monday, May 30, 2016 at Huntington Place in Janesville, Wis. He was born Feb. 5, 1927 in Clinton to the late Henry and Florence (Henschel) Hahn. He graduated from Clinton High School class of 1945. Glen married Mildred Nielsen on Sept. 3, 1950 and if you listen carefully you can hear them dancing to Sentimental Journey. She preceded him in death on May 2, 2003. Dad, Grandpa, Great (he really liked that one) was the third generation to work the family farm. He was a past President of the Christ Lutheran Church Council, past President of the Clinton Cemetery Association, Clinton Town Board Member and Board Member of Clinton Co-op. Glen really enjoyed traveling, he and Mildred traveled to Europe and China with friends and family. And the fishing trips with Jim, Joe, Nick and Bob were quite the party; at least that was the rumor. He enjoyed the winter trips to Florida with Mom and summer vacation with Mom, kids and grandkids and great grandkids the most. Going fishing in Grandpa’s boat was the best. Of course Grandpa always caught the first fish, but we know he loved seeing the excitement on the kid’s faces when they hooked a “big one.” And don’t forget the stories on the sun deck with the Zimmerman’s. He was also a member of the Clinton Kitchen morning round table where he could be found most days solving all the worlds’ problems with Jim and a cast of dozens. Glen is survived by his brothers, Marvin, Leon wife Donna, sister-in-law Delores. Plus many nieces and nephews. Glen is also survived by his sons, Alan and his daughter Elizabeth; David his wife Donna and their children Derek his wife LaSonda, Micheal his wife Paula and Danielle her husband Matthew Christensen; Jeff his wife Paula their children, Carl his wife Debbie and Anna; and his great grandchildren Ryan, Owen, Aaron, Roslyn, Carl Jr., Noah, Allison, Henry, Millie and one soon to be here. He was preceded in death by his parents, wife Mildred, brothers, Gerald and Gene, sisters-in-law Eleanor, Peggy and Dorothy and brother-in-law Jay. We would like to thank the Staff of Huntington Place and Heartland Hospice for their care and compassion for Dad, Grandpa and Great Grandpa. We would also like to thank special friend Shirley. And we cannot forget the kindness shown by Josh and Pastor Schockman. Over the past couple of days the one thing we heard over and over was “Glen was such a fun guy.” We appreciate the thoughts from all who knew and cared about Dad. Enjoy that martini, you earned it. Glen’s Funeral Service took place at 11 a.m. on Saturday, June 4, at Christ Evangelical Lutheran Church, 300 High St., Clinton, Wis. with Rev. Gary Schockman officiating. Friends were received on Friday, June 3, at the Brian G. Mark Funeral Home, 504 Milwaukee Road, Clinton from 4 until 8 p.m. and again on Saturday at Church from 10 a.m. until the time of service. Internment took place in Clinton Cemetery. Memorials may be in his name to Christ Evangelical Lutheran Church. Please share a memory or a condolence with the Hahn family on our website.